EXTRAS The top hotel convention centre that Tirana needed urgently and which, according to its design, corresponds to the needs of medium-sized events (up to 250 participants). The arrival of the hotel chain Hilton in Tirana, was the hit news of the local and regional media at the end of this summer. The arrival of the hotel chain is a signal that Tirana is becoming a fast-growing tourist and meetings destination. The investment in the hotel amounted to over 19 million euros, and the hotel got a location next to the green boulevard Gjergj Fistha. It is a business-residential part of the city, which is 3km from the Skenderbeg market. The location of the hotel may be less attractive than in competitive urban hotels, but it has its advantages, especially as regards parking and access to other parts of the city, which was also recognised by many corporations that have shifted their representative offices to this part of the city. Albania represents one of the fastest growths in tourism. This is also followed by ever-increasing airline connections, which is the basis for the development of international congress tourism. Other transport infrastructure is also improving every year; some work, however, is still required in the area of traffic culture. The segment of improvements also includes increasing and more efficient public transport. For guests arriving at the hotel, there is a large parking lot, which is one of the advantages of the hotel. It is easy to travel around the city with taxis, which are omnipresent and well-organised for a very reasonable price. The architecture of the hotel is not surprising and belongs to the category of hotels, where everything is subordinated to functionality. The cube-like facade of clean lines in brick tones will neither fascinate nor disappoint you. There are some surprises in the lobby that contribute to your well-being. The most striking are the pillars dressed in real moss, and the correct and intimate lighting. Interesting is also the solution of hotel store where you can fill your mini bar, which is in this hotel category clearly a new Hilton concept. There is also a hotel bar that invites guest to indulge with an open minimalist concept, whereby Hilton is inspired more usually by lifestyle hotel chains. The bar passes into a friendly restaurant with an outdoor garden, where breakfast is served, and which is pleasant and homely enough. A month after the opening, the staff is well-organised, youthful and very friendly. There are complications with the computer system here and there, but otherwise the team works very professionally. The cuisine follows the chain’s classic international offer, without surprises and without excessive innovation. This sums up the room service ranging from club sandwiches to Caesar salads and burgers. A different story is the hotel’s breakfast, which is on a very high level, both by the choice of food and the quality of the food offered. For more demanding culinary nomads, there are plenty of choices outside of the hotel in Tirana. We must also commend the exceptional tidiness and cleanliness of the hotel. The rooms are for business guests standardised and are furnished in warm light brown shades. At first glance, they seem rather lean, but this feeling is broken by the pleasant pieces of furniture, lighting and general practicality. There are plenty of storage surfaces, but we missed a slightly larger desk that comes handy for business guests. Beige shades continue in the bathroom, which is properly equipped and surprises with quality cosmetics. Hotel bedding is top notch. The convention centre is modernly equipped, the largest hall Butrinti accommodates 240 participants, and is complemented by five smaller halls and a luxuriously decorated lobby. This is suitable for exhibitions and coffee breaks, and we believe that the centre will be fully occupied due to its functional design. An exceptional breakfast, which could be classified as a higher category in terms of the quality of the ingredients and the way of presentation. A smaller nitpicking comment goes only to the fact that the working areas for the computer in the rooms are a bit small; it is much easier to use computers in the spacious bar where there are plenty of tables available and you will be in good company. The arrival of the hotel chain in the city is a good sign and will greatly contribute to the greater visibility and internationalisation of Tirana as a meetings destination in the future. 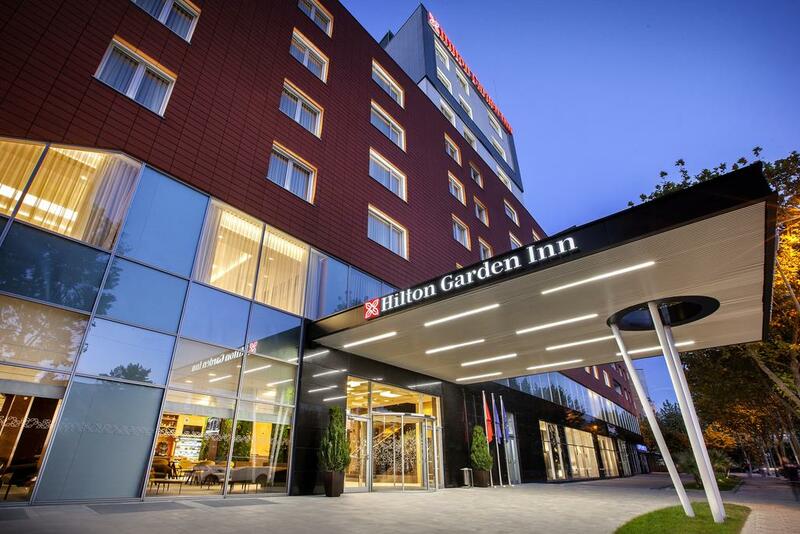 Hilton has branded the Garden Inn brand to the extent that you know exactly what to expect as a guest. This is no different in the newly opened hotel in Tirana, which in terms of architecture is not a surplus, but its ergonomics, utility and versatility are impressive. It easily hosts a large congressional group, and it is suitable for classical tourist groups and businesspeople as well. In addition, the hotel brings into the destination new hotel standards and a greater recognition of the Albanian capital. Without a doubt, it brings an excellent price / quality ratio as well. Previous articleWill the Cryptocurrencies be the Trending Topic of Prague Meetings Industry?